The heating, ventilation and air conditioning (HVAC) system of any building is like the respiratory system of a human being. It controls the movement, quality and temperature of air to ventilate, warm and cool the organism. 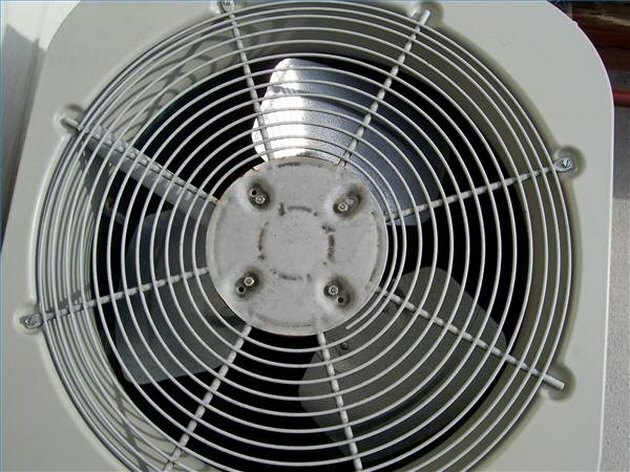 Energy is consumed by the parts of the system that heat and cool the air and movement of air with fans requires energy. Air or water is heated or cooled using direct contact with heat or refrigerants and pushed through pathways (ducts or tubes), escaping through outlets or vents until it travels throughout the structure. The air or water then returns to its origin to be heated or cooled again. Well-engineered ventilation patterns aid circulation, introduce fresh air and controls the buildup of carbon dioxide (a byproduct of human respiration), carbon monoxide (from combustion sources) and miscellaneous toxic gases from building materials and household activities. Well-designed HVAC systems, passive filters, insulation and gravity make the system more effective and efficient. New conservation practices and systems using alternative energies are being designed to improve efficiency. A heat vent in a forced-air system. 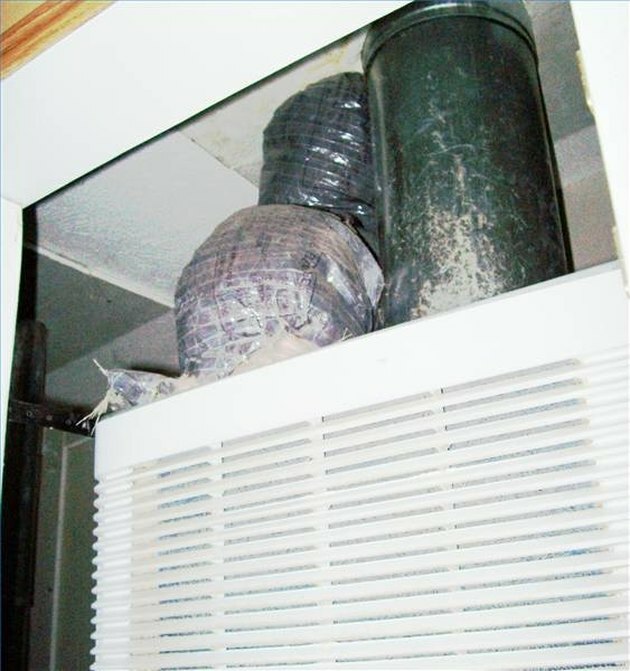 A chimney and duct (left) rise from a gas furnace. Heat may be direct or forced air in nature. Direct systems take the heat directly to an area, using hydronic (steam or hot water) or electric radiant floor systems, baseboards or radiators. Forced air systems heat air in a furnace using gas or electricity and then force it throughout the building using one or more fans. 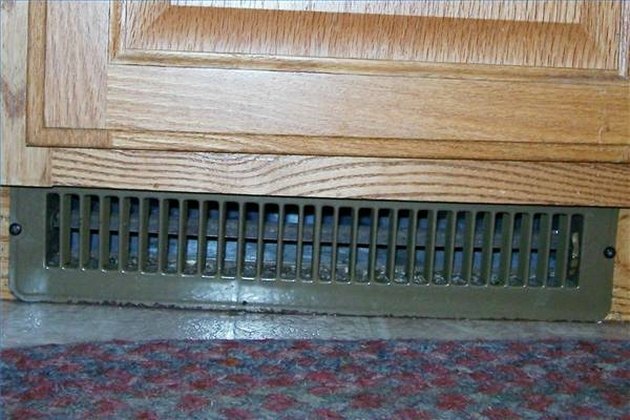 Forced air heating relies on a "return" of cold air to the furnace and many forced air systems have two sets of ducts and outlets---one circulating hot air and one with vents on or near the floor to return the sinking cooler air. Heat may also be generated by a "heat pump" (also called an exchanger), a more efficient generator that uses compression and condensation to draw heat out of air in cool weather. Heat pumps can use air or ground (geothermal) heat but lose efficiency when the temperature outside is a great deal cooler or warmer than the indoor air, making them an efficient supplement for HVAC systems in some areas. A central air conditioner unit is basically a one-way heat pump. Environmental engineers and other climate control professionals frequently use "HVAC-R," or heating, ventilation, air conditioning and refrigeration in place of the older HVAC because refrigeration has become so important to HVAC systems. Traditional air conditioning units consist of a compressor and condenser that cycles the cooled refrigerant through a box called an "air handler" in the building's ventilation system, using the fan in the furnace to force cooled air through the duct work to existing vents. 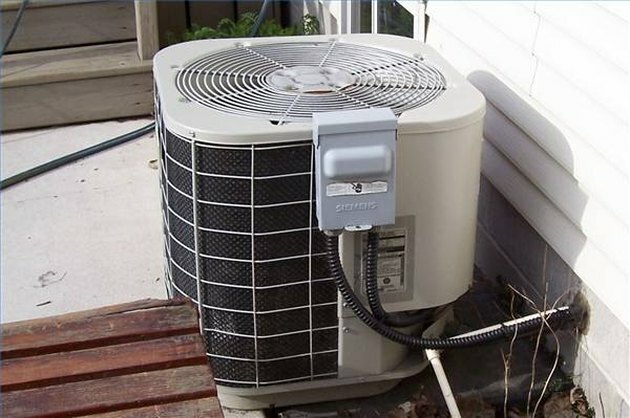 A heat pump is basically a two-way air conditioner and heat pumps make more efficient air conditioners than they do heaters. Where there is no duct work (because of a hydronic or electric direct-heat system), a ventilation system must either be installed or specialized systems known as "mini-duct" or "mini-split" ductless air conditioning. These systems run small ducts that use high-pressure fans or run the refrigerant itself to an air handler with a fan in each room to be cooled. What Is a DX HVAC Unit?